Oh and this one: I liked the yellow flowers, although there is some melancholy in the images. Ofcourse, that is also throughout the book, and the look of the little prince is a look of wonder. 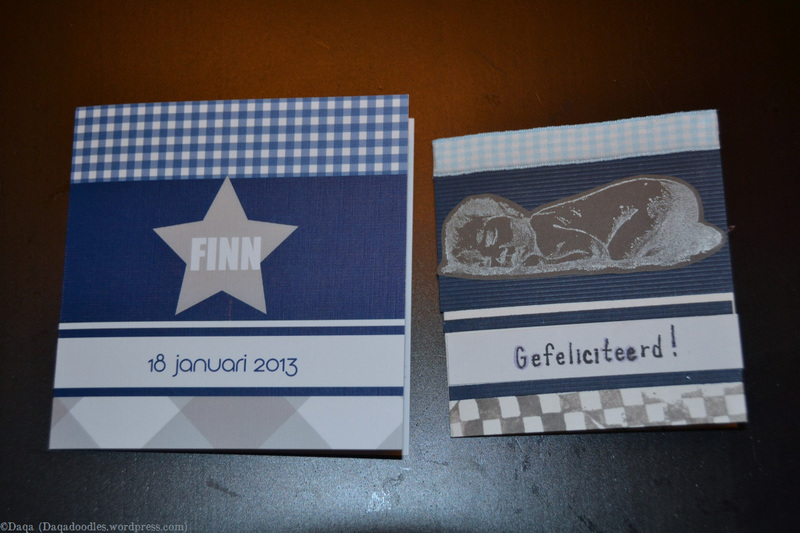 I thought about making the entire card myself, printing it and finishing it with stamps, even colouring those stamps. The prints didn’t look very well, so I eventually had them printed. 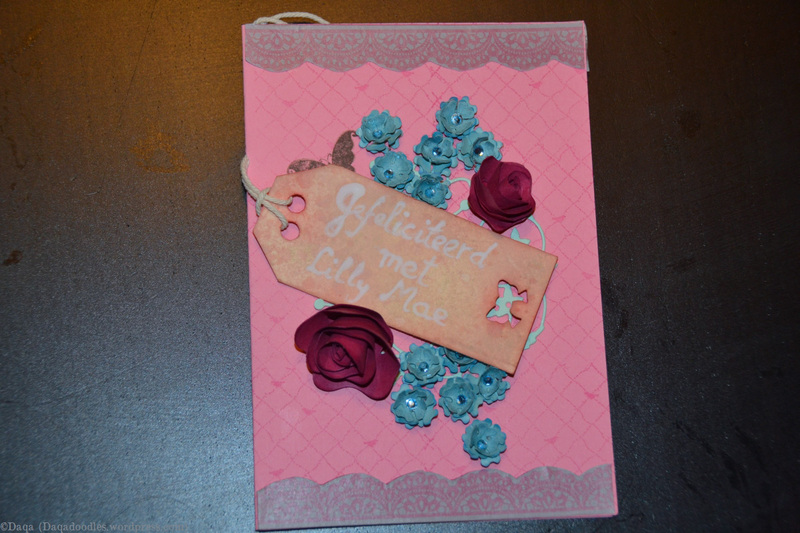 But I did order handmade stamps, from http://memitherainbow.blogspot.nl/search?q=prince. On the 14th of June the kids and me painted a little. Tobias first painted something on his sheet, and then he started painting a vulcano. Next, he said the vulcano erupted and the entire sheet had to be covered with yellow/orange paint. I loved it, and when it was drying I thought this was a perfect background for the card! See the vulcano on the bottom right? Freya’s painting (and the circles from where the lid or the paint jar had fallen or stood). As it is childrens paint, it dried up a little pale, so I edited the photo’s digitally. (anonomised) family tree – Lodewijk has been named after 3 of his great-granddads (they were called Louis), and as second name he has the second name of great-granddad nr 4. A bundle of innocence – Our third child is born! Well he wasn’t born just now or yesterday, but almost exactly 2 weeks ago. (As I’m typing this, it’s 22:31, and he was born 2 weeks ago on the 3rd of july at 22:47). He got a bit of a classic name – Lodewijk. It means: warrior/fighter for loot. The two other names he got mean: strength of a lion and protector of mankind. Lodewijk is the dutch version for Louis, or Aloysius, althouht those two names are/were quite common in (the south) of the Netherlands too, as there is / was lots of French influence here. We are all doing fine, and enjoying him a lot. He’s very sweet. Then again, babies cry most when they are 6 to 8 weeks old. Only a short post, was a busy day today! More about the birthannouncement card and how I made it later! I’m still behind in posting all the cards I made. In january I had received 2 birthannouncement cards. 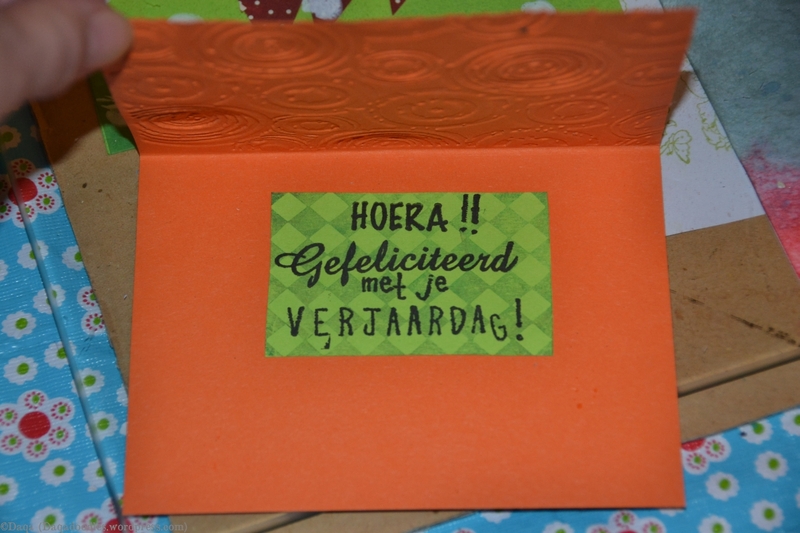 I wanted to make a congratulations card that looked very similar to their card, as usually an announcement card is picked with care, and with attention to details. I wanted to add a personal touch in the way of showing that I made these cards myself, that I took the time, made the effort to make this card for them, to celebrate this special happening. 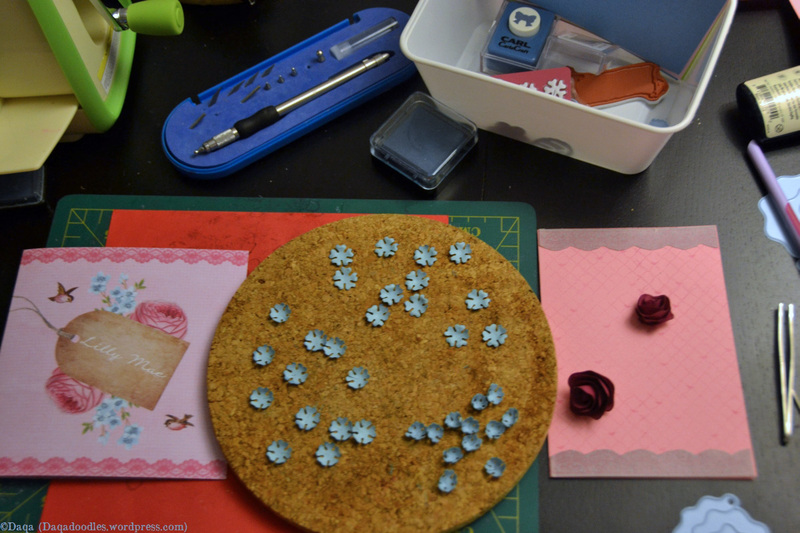 The small flowers are a die from Joy!Craft, Big flowers are Marianne Design English Rose, the lace die (blue beneath the tag) is from Memory Box – Floral circle. The washi tape is from Vivi Gade design. And the stamp on the paper, of the bird in the fence? Eeeh…. Thank you google, the stamp: is from Prima Marketing PIXIE GLEN Clear Stamp 2.5 x 3inches (product code 550905) The lower blocked stamp is from Rubber Stampede, nr. 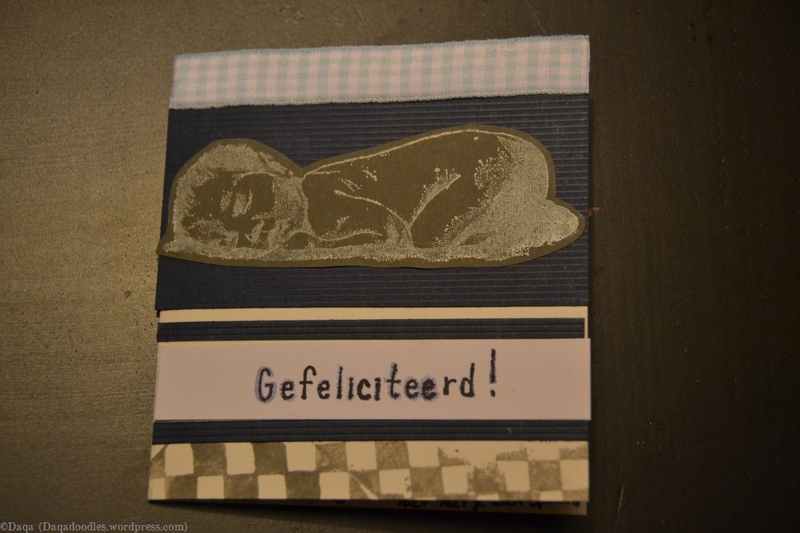 3218F Harlequin.The baby stamp is from Stampinback.nl – sleeping baby. Ribbon and paper were probably not of a special brand. Again the Harlequin stamp. 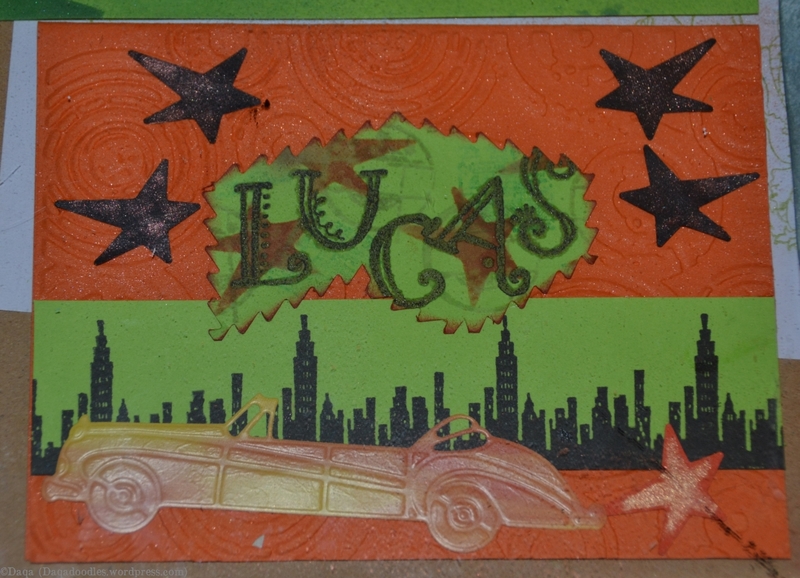 Furthermore a Marianne desgin die (the car), probably Kars city scape, and embossing folder retro circles from sizzix. 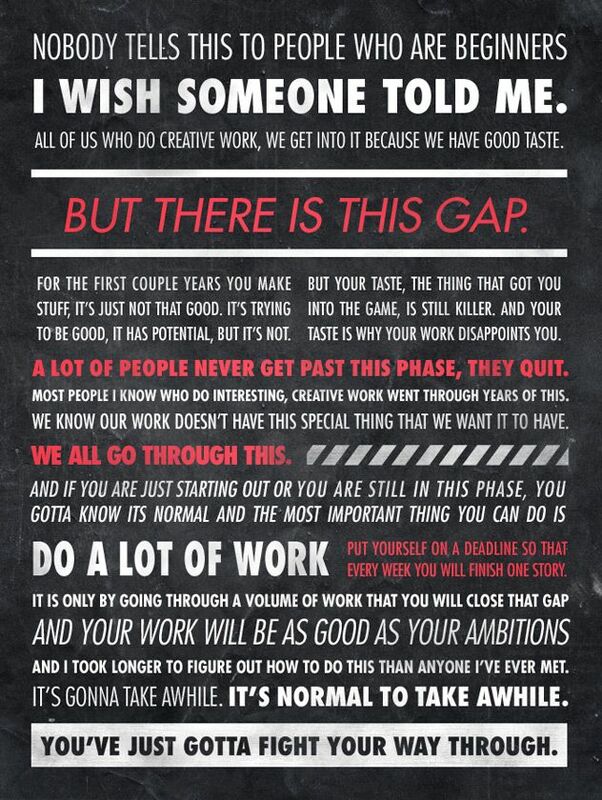 That is quite some tekst, so no room for a big or a lot of images. I tinkered a bit (actually a lot) on the green edge of the front, and tinkered a lot on an image of Charlie. 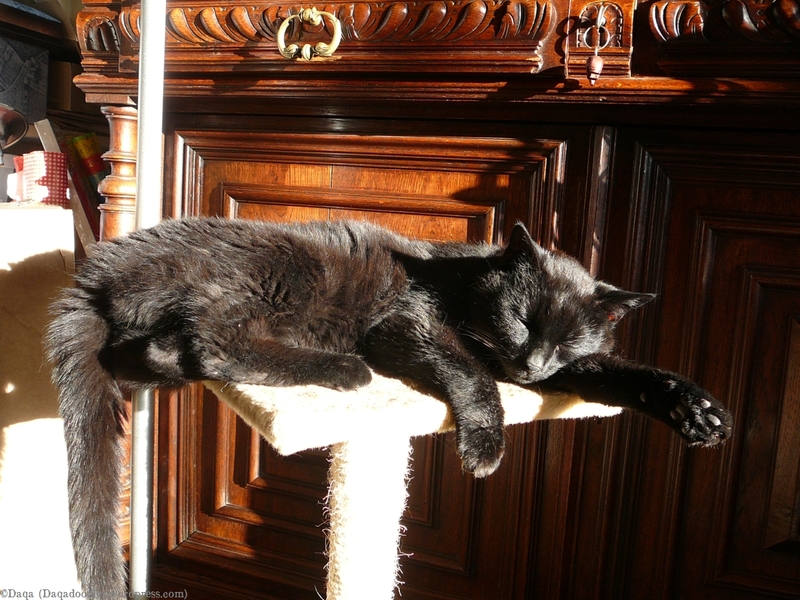 The original image of Charlis is a picture of about 2 years ago, when he was lying on his cat-thing in the sun. I have used it in my header now too, as I do really like the image. Here is the original photo. Yup I bent his tail to fit better on the card. And I made an end to the tail, sort of. Maybe I shouldn’t have posted this photo, as now you can see that I bent the tail, that it doesn’t look entirely natural. 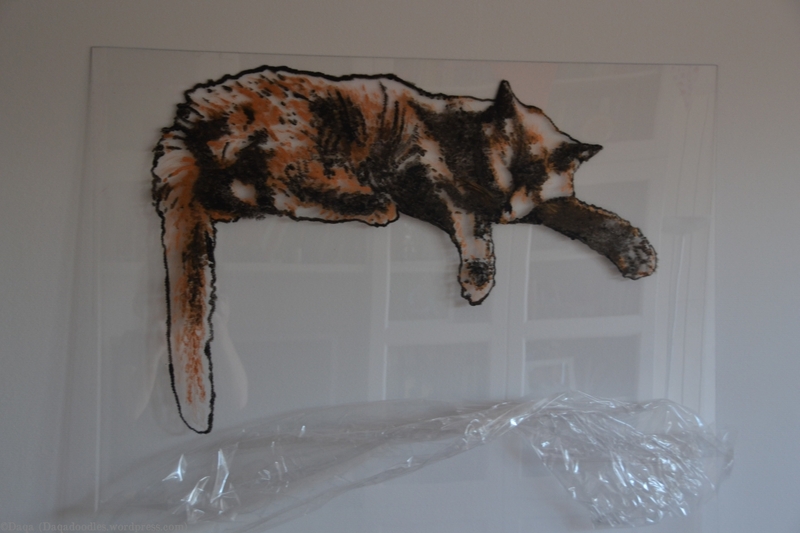 If I hadn’t posted the photo, you might have thought it was a normal pose, a cat who is swinging his tail maybe. I had actually selected this image also for the front, but had decided not to use it for that as the perspective / horizon was difficult. 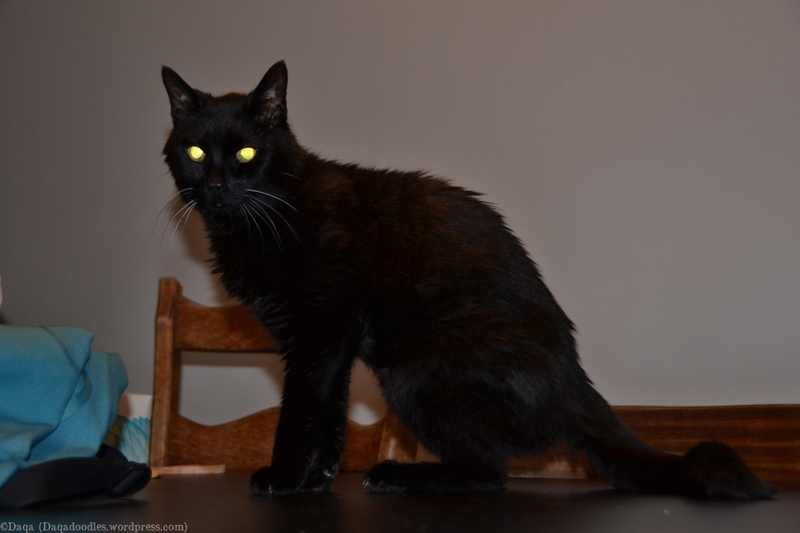 I then decided to make new photo’s of Charlie, with him on the table so to get a good silhouette. Still, this image had to be used. So it was used, on the inside. I like it a lot, it brings peace and relaxation to the card. 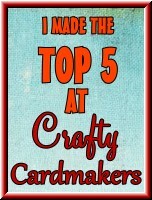 The site where I had my cards printed didn’t have any lettertypes I liked, so I also added the text to the image. Downside is that once you have added the text to the image, you can’t select it as text anymore, it will become pixels – part of the image. So lots of layers, lots of testing. I have downloaded lots of fonts (I like fonts) from various sites where you can download free fonts (don’t have the site names at hand at the moment). After some testing, I choose the font “DS_Mysticora“. 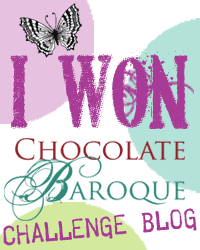 Oh and for the name Freya on the front I have used the font “Beauregard“. Tobias couldn’t handle the mischief alone any more, now he has a sister to help him! The (or rather, “a'”) Dutch word for mischief is “kattekwaad”. The word is made up out of two words: kat & kwaad. Kat means cat, and kwaad means angry, or harm. The combination means mischief, like little kids do, ringing doorbells and running away, stuff like that. Not that cats ring doorbells, but they do plenty of naughty stuff. 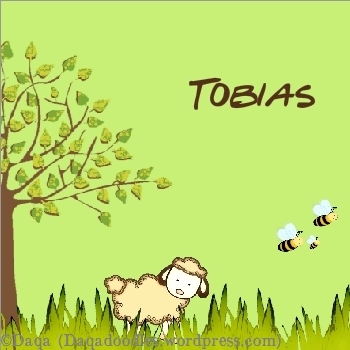 I liked to use the word as cats are also in the theme of the card, and it involves Tobias as well. As Tobias is on the front of the card, welcoming his little sister, this just seemed perfect. I am not sure anymore in which order I had chosen the design/rhyme: Did I choose the rhyme because of the picture of Tobias I had for the front, or did I put Tobias on the front because of the rhyme? 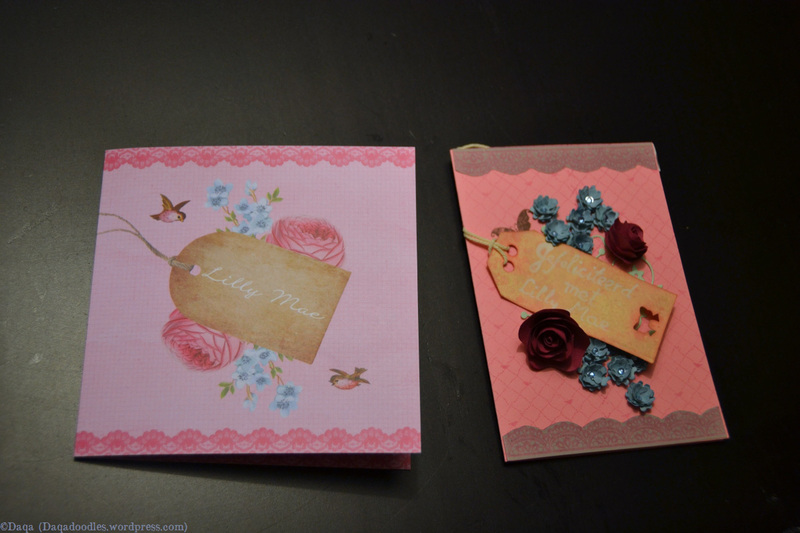 I think it was the first option, as I remember having felt “finally the card is done” after I had finished the front. I had yet to get started on the inside though. Just to give you an idea of how much time the front had cost (in comparison to the inside and backside). On the backside I wanted an explanation of the meaning of the name Freya, as I love the meaning. When looking at baby names, I always look up the meaning of the name, as I do take that into account when choosing a name. I loved the meaning of Freya. Ofcourse, I allready knew it had to do with the scandinavian godess Freya. In the previous post I have linked to the wikipedia site about Freya and the meaning of her name, so I am not going to repeat myself here. The Dutch version is a compilation of information from various sites (also the dutch wikipedia site). The text is an explanation, a dictionary page-like. Therefore I wanted a font that looked old, ancient, from the time when people still believed in those gods, a font that matches the origin (scandinavian like). The font I chose is “Faith Collapsing“. I love how it is faded in places eventhough people might think the card didn’t print well. It’s like an old piece of text found in a dungeon. Hmm I realize now that it would have looked better if I had written it in the present tense, now it is in the past tense for the most part. Another thing I thought of later is that the small text on the inside might be a bit on the small side, especially for people whose vision is not as good as it used to be. So this was the story of the birthannouncement card for Freya. Fall, Scandinavian, the meaning of her name is incorporated into it, still a baby element in it, personal, made with images from the world around us. What do you think of it? Do you have a card that to you has a story but probably to others it’s just a card? Next post: how to paint a picture on a polystyrol sheet, Part 1, preparing the image. 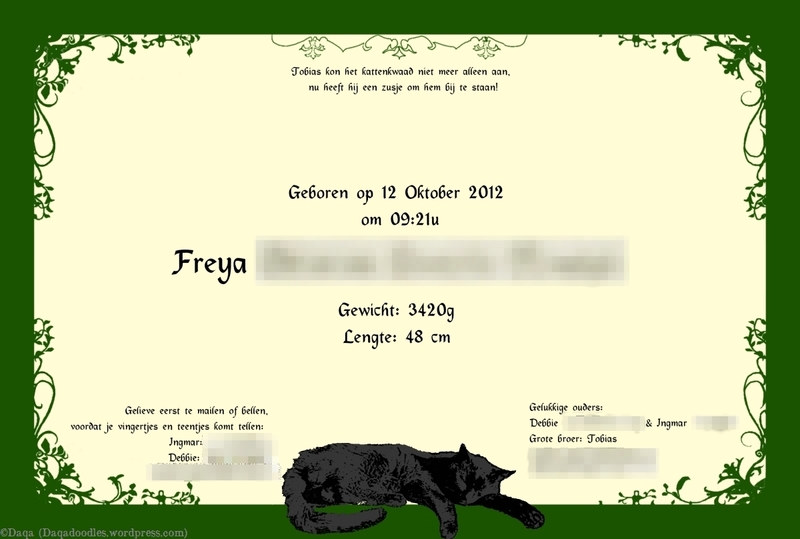 First of all, let me start by announcing the birth of my 2nd child, Freya. She was born on a Friday (jay! I hoped she would! ), on the 12th of October 2012 (pretty date, huh?). Labour went well, my recovery also. Now we’re trying to get a routine going again, and find a way to handle 2 kids at once. Now back to the birthannouncementcard. Besides crafting a lovely sweet daughter in my belly, I’ve made the birthannouncement card. First, the comic. I have several comics of the serie Thorgal, and I love the drawings and the kind of Scandinavian mythology. 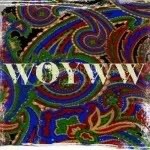 I love the website. 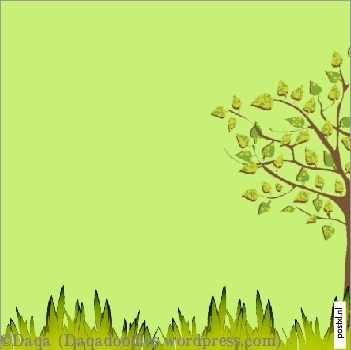 That is where I got the idea of having these kind of layers: a nature background, then a cutout layer on top of it with shapes of leaves in it (the fall theme), and then a silhouette of something to do with the baby. In Norse mythology, Freyja (Old Norse the “Lady“) is a goddess associated with love, beauty, fertility, gold, seiðr, war, and death. 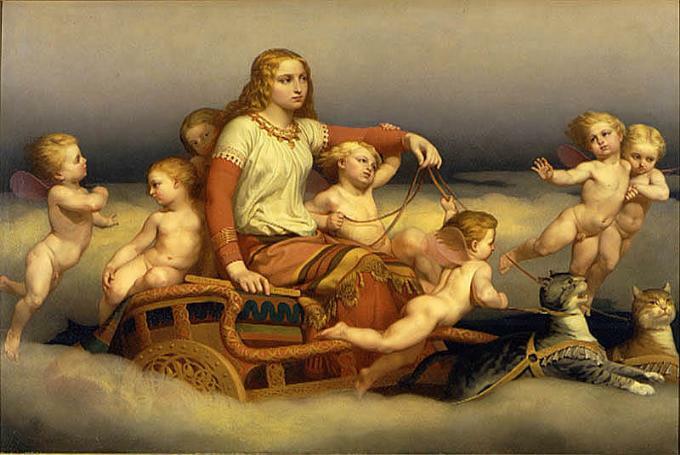 Freyja is the owner of the necklace Brísingamen, rides a chariot pulled by two cats, owns the boar Hildisvíni, possesses a cloak of falcon feathers, and, by her husband Óðr, is the mother of two daughters, Hnoss and Gersemi. Along with her brother Freyr (Old Norse the “Lord“), her father Njörðr, and her mother (Njörðr’s sister, unnamed in sources), she is a member of the Vanir. 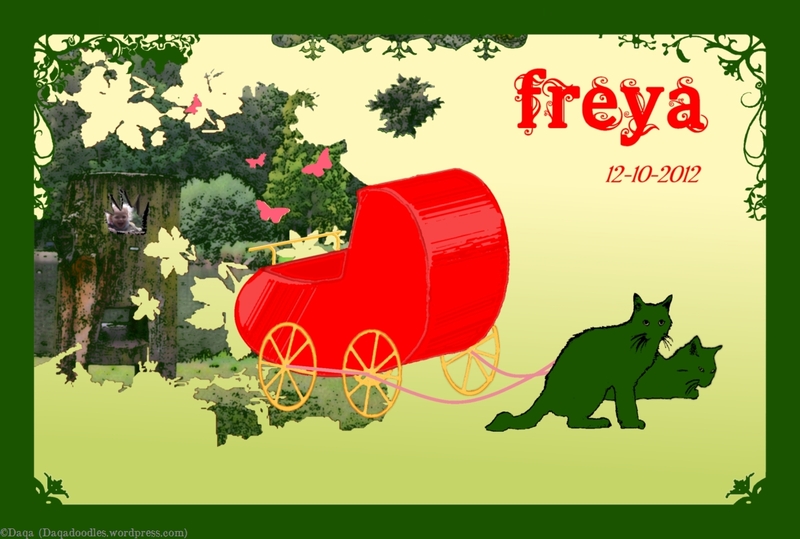 Stemming from Old Norse Freyja, modern forms of the name include Freya, Frejya, Freyia, Frøya, Frøjya, and Freia. 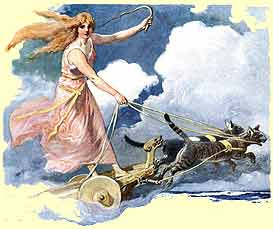 And if you search for images, you find many images of her on her chariot, being pulled by two cats. So that would be the silhouette: Freya being pulled by two cats. 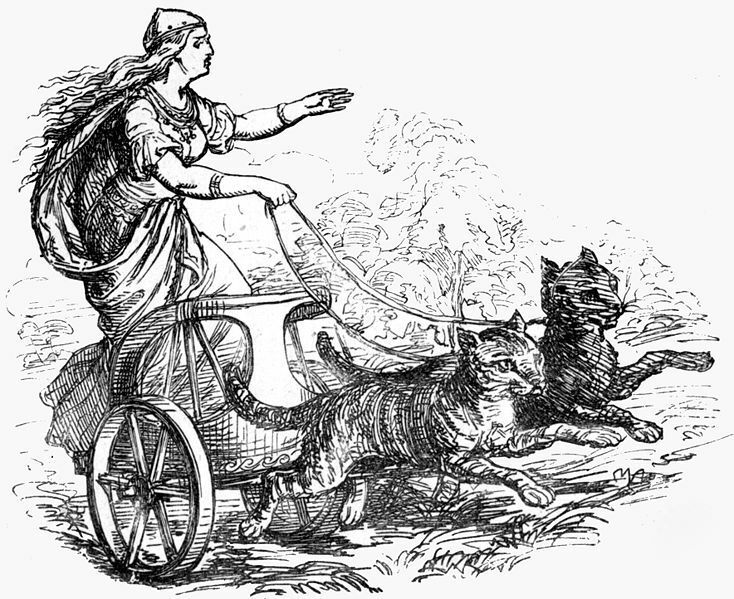 But this is a sweet baby Freya, not a godess going to war or something, so it’s two cats pulling a baby carriage. The season is fall. Fall with it’s beautifull shapes, the leaves, with the playfull wind blowing them all around, and with the fresh rain that washes the sweat from the summer away. The leaves were allready incorporated through the Thorgal theme. Fall with it’s beautifull warm colours, the greens, browns, yellow, reds and gold. Only, the first few choices I made as colours made the image quite dark. As it is custom printed, it was not possible to add gold accents to the card. Or maybe it is but then it would cost lots more money I suppose. My other objection to gold colours was that it might look like an announcement of death, isn’t that often with a gold line around the card? So after some searching for colours I finally found some I was quite ok with. Yellow and green. Coïncidentally, the colours of The Hague are yellow and green as well (though a brighter shade). You can also see some rough sketches of the carriage and the cats, and different backgrounds. More on the cats later. With these things in mind I set out to make the card. I did use a screenshot of the Thorgal page as template, enlarged it, traced around it, cut away, filled in etc. I searched for a background image. Wouldn’t it be fun if it was made from a real photograph? So I went out an made pictures of trees and parks in the area. I didn’t want them to look like photo’s, I wanted them to look like drawings, in the Thorgal style. So lots of trial and error before I was happy with the result. Original image on the left, edited image (with an insert of Tobias) on the right. This is the source of the insert of Tobias. His face isn’t in focus but you don’t notice on the card as it’s quite small there. 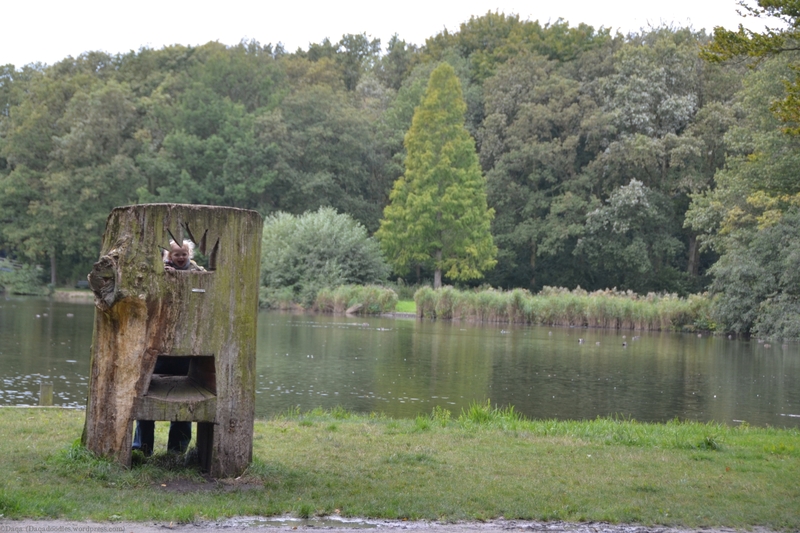 The legs you see are from my partner, ofcourse I didn’t let Tobias climb up there without someone standing near! A tiny bit of the wall around the property Huis Ten Bosch of the Dutch Queen is visible in the background. So that was the background and the colours. 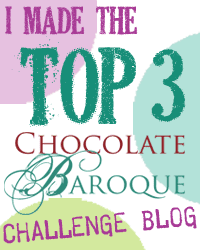 On to the carriage and cats! No interesting story about the carriage, first I hand-drew a carriage and cats, then scanned it and used it for layout purposes (see the colourtesting for my terrible drawings). After that I used the scan as a template to make the drawing better. Oh, and all of this I did in Paint.Net (a free photoshop like editing program). For the cats I searched high and low on teh internetz. It’s hard to find an image of a running cat! So away with running cats. I didn’t want to use internet images as I had gotten them from sites that actually require you to pay for the image. So what now? Not entirely in focus, but hey, it’s for a silhouette. And here he finally looked up. So, Charlie is my model. It does show he’s old, with his fur not being that smooth and the curve in his back being high, but I kind of like that. The old cat brings the young baby. Charlie used to have an older brother, Fred, but he was put to sleep about 4 years ago. 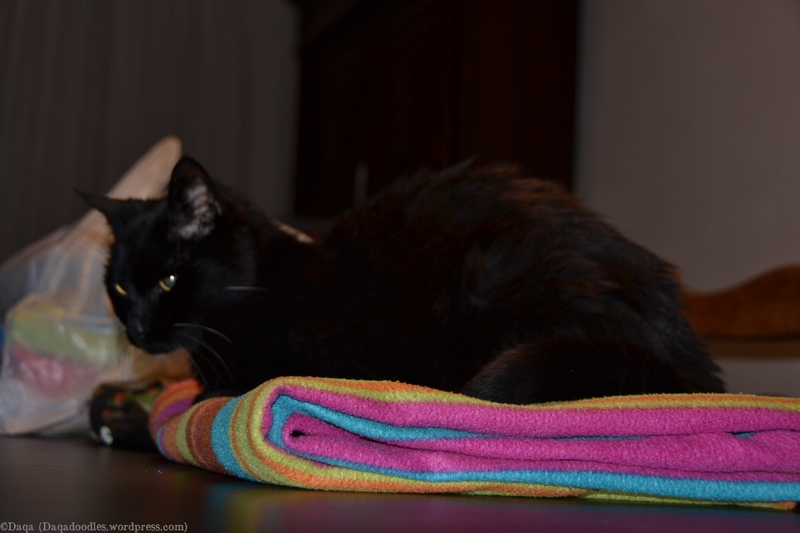 He had diabetes and kidney problems, and we found out too late, he was in pain allready. Charlie and his shadow, pulling the carriage. Not pulling, but resting after having pulled the carriage. That’s the front of the card. It took me lots of hours, trial and error, but I’m pleased with it. 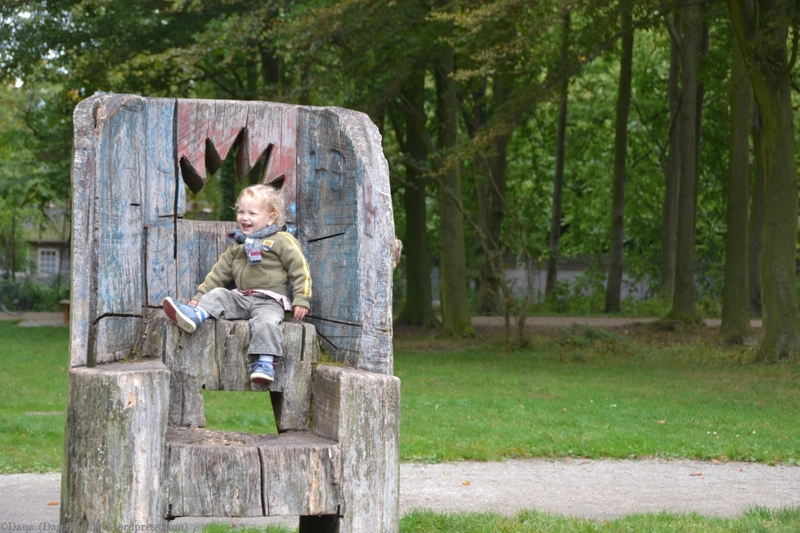 Not everyone will like it, and without explanation the card has lots less meaning (like the picture in het Haagse Bos where we regularly walk, Tobias laughing at the new arrival, the fact that the cats aren ot running but resting, the Thorgal theme and lots more that fits with her name). It’s a unique card, and I hope she will like it when she is older. 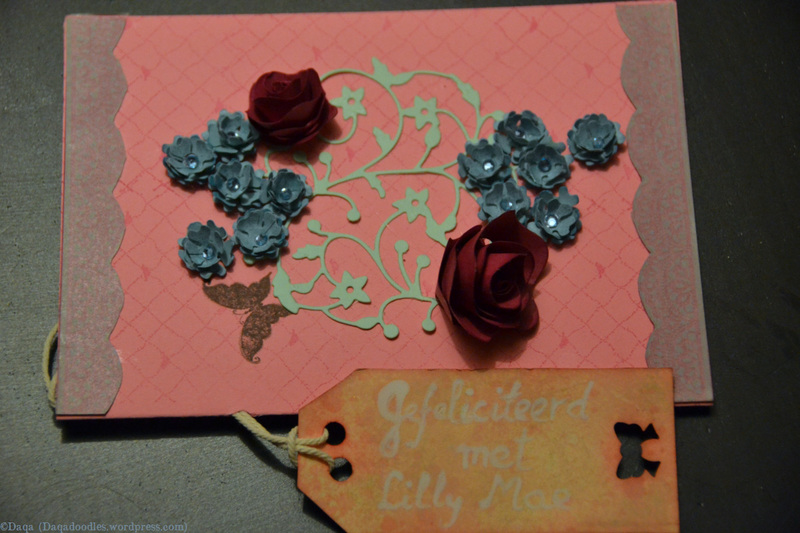 Next post: the inside of the card and the backside! Tijdens mijn zwangerschapsverlof werd het toch wel eens tijd om een geboortekaartje uit te zoeken. Aangezien mijn kindje verwacht werd in de lente wilde ik iets met de lente. Schaapjes. Ik heb gezocht op geboortekaarten met schapen maar niks (wat ik leuk vond) gevonden, en als er iets was, waren dat kaartjes die uit het assortiment waren. Tijd om zelf iets te ontwerpen dus. / During my pregnancy leave it became time to search for a birth announcement card. Because I expected my baby to be born in springtime I wanted something that associated with it. Sheep. I searched for cards with sheep or lambs on them but I didn’t find anything (I liked), and if I found something it was out of the collection. Time to design the card myself! Met behulp van wat bronplaatjes van het internet kon ik beginnen. Ik had ergens een foto van gras gevonden en dat bewerkt in paint.net, een aantal plaatjes van schapen bekeken en 1 als basis genomen en die aan allerlei kanten veranderd, ook de bijtjes hadden als basis een bestaand plaatje. De bijtjes heb ik uiteindelijk opnieuw getekend en gecontrueerd, maar het bestaande plaatje diende als hulpmiddel voor de verhoudingen. Hetzelfde bij de schaapjes. Paint.net is trouwens een gratis foto en afbeeldingsbewerkingsprogramma wat een alternatief is voor photoshop. Je hebt er wel nog wat addons/plugins/extra’s bij nodig wil je het als volledig photoshop vervanger gebruiken denk ik. Ik ben geen expert met beide. Paint.net voldoet voor mij prima, ik ben er blij mee 🙂 / With the help from some sourceimages on the internet I got started. I found a picture of grass and edited it in Paint.net, looked at several (tons) of sheep imates and took one as basis model and changed it. Even the little bees had an existing image as source. I did redraw the bees completely again, the existing image then only served as a means to get good sizes. The same for the sheep. Paint.net is a free photo and image editingssoftware, a good alternative for photoshop. I think you do need some addons/plugins/extras for it if you want to use it as a full replacement. By the way, I’m no expert with any editingsoftware. De boom is wel een bronplaatje van Postxl.nl, dat is de site waar ik het kaartje heb samengesteld. 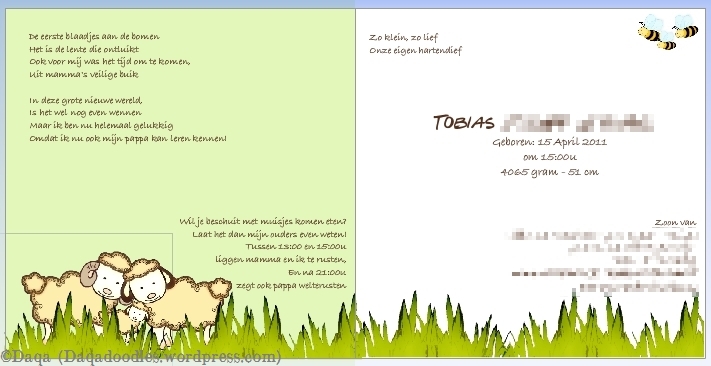 / The tree is an image from Postxl.nl, that is the site on which I composed and ordered the card. Daarna de binnenkant. De meeste eerdere ideëen mbt afbeeldingen en kleuren heb ik weggegooid, pas toen ik aan de tekst begon heb ik die ook bewaard. /Then the inside. Most previous ideas in regards to images and colors I didn’t save, only when I started with the text did I save those drafts. 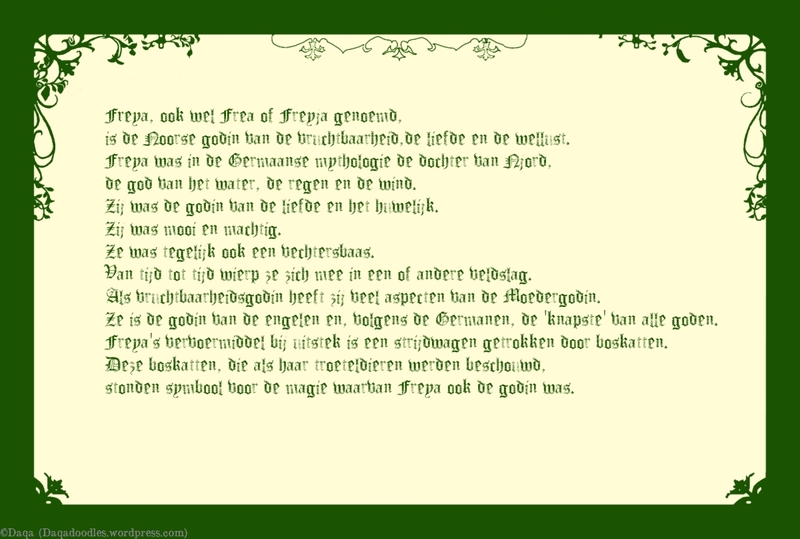 en nog wat schuiven met de tekst en een andere kleur: / moving the text and changing colors. Uiteindelijk toch maar wat geschrapt. /Eventually I did delete some text. Zijn de schaapjes niet schattig?